Can you save Pauline from the clutches of Donkey Kong? Help Mario scale the construction site to rescue his girlfriend, Pauline. Dodge the fireballs and barrels that Donkey Kong hurls down the ramps and ladders to thwart your efforts. DK Junior is on a mission to rescue Donkey Kong from Mario's cage. Jump from vine to vine collecting bonus fruits and avoiding lethal snapjaws. Then move on to tougher stages. Jump platforms, dodge sparks of electricity, and watch out for those birds. Use your skills to get the key that will set your Papa free. --From the NES Donkey Kong Classics instruction manual. Play Donkey Kong Classics Now! In Donkey Kong Classics, play both sides in the war that Donkey Kong and Mario both take part in. First play as the little guy, Mario, that is trying to save his girlfriend, Pauline. Then play as Donkey Kong Jr. and try to save your father, Donkey Kong, from Mario, the same man that he was fighting against in the first place. Donkey Kong Classics is twice the game for the same price, now that's a good deal! 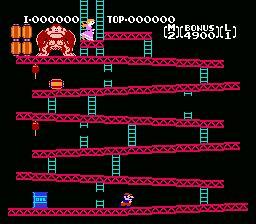 In Donkey Kong, you assume the role of Mario, a carpenter. While working, the big ape known as Donkey Kong captures Pauline, and you must save her! In Donkey Kong Jr., Mario captures Donkey Kong. You take the role of Donkey Kong's son, Junior. Only he can save good ol' dad from the clutches of Mario. In Donkey Kong, you must avoid Donkey Kong's barrels and other obstacles. You might want to grab the hammer to smash barrels and baddies with. Grab the items, like the purse, to gain bonus points. Reach Pauline to advance. In Donkey Kong Junior, you have the same rules as Donkey Kong, but this time, you avoid red and blue chompers, and climb vines instead of ladders. Reach Donkey Kong to advance to the next level. Select Button Selects between Donkey Kong and Donkey Kong Jr. When playing Donkey Kong Jr. remember that you will go up faster on two vines while you will go down faster on one.